We have had our snap cubes for over four years now and we love them, so when Learning Resources asked if we would like to test out the Mathlink Cubes Activity Set I immediately agreed. My initial thought was snap cubes with activity cards but my youngest immediately pointed out that each cube had a shape on each of its four sides so in his opinion they were better than his snap cubes. The simple inclusion of the shapes on the sides of the cubes was a big winner for my son because he likes to be precise, so while he is working with the cubes he will make it that all the triangles face a certain way or that there is a pattern with the shapes, for him it makes the cubes more interesting, which means he happily sits for longer periods of time. The photo below is what the Mathlink Cubes look like compared to our normal snap cubes (our snap cubes do look a bit scratched and more “well-used” in the photo but that is because we have had them for over 4 years and we have used them A LOT ). 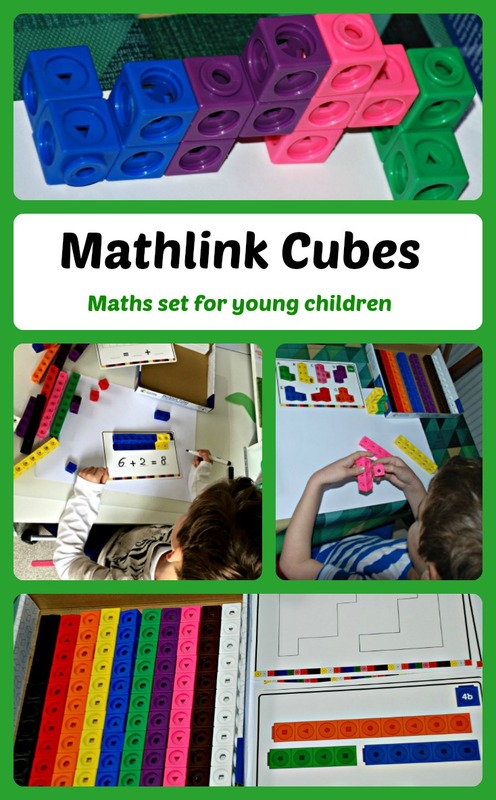 The mathlink cubes are split into 10 different colour groups (10 cubes in each colour) and the set comes with 15 double-sided activity cards. The cards start with basic patterns, addition, subtraction and work up introducing division and creating 3D shapes. And in case you are wondering you can use white board marker pens on the cards as they wipe off perfectly. For me the activity cards are a starting point. Something for my son to use, to get an idea and then hopefully he will expand on the idea himself. A great example was the 3D shape activity cards. After building the shapes on the card both my kids actually sat down and created some of their own shapes and also tried to find different ways of combining the shapes together. This is why we have always liked snap cubes, the kids enjoy playing them, they make Maths fun and this Mathlink set for me is snap cubes improved. It is the same maths manipulative that I like using but with the added bonus of the extra shapes on the sides of the cubes and the extra the activity cards. My son did comment that the cubes were slightly harder to take apart and click into place but it did not deter him and total honest mom moment I actually liked the fact that it was slightly harder for him to work with the cubes as it ended up being a great finger strengthening exercise. I was sent the Mathlink Cubes Early Maths start set by Learning Resources in exchange for me completing a questionnaire on the set. This entry was posted in Home education resources and tagged educational resources, home education, homeschooling, learning resources, mathlink, maths ideas. Bookmark the permalink. Hi Julie. I found something I will leave the link below. But I would recommend emailing Twinkl and ask for something.